Was $70, now only $39! Imagine if you could get the weight loss benefits of Gastric Band Surgery without spending thousands of dollars, and without going under the knife? With this professionally-recorded hypnosis program, now you can do just that! Gastric band surgery offers excellent success rates for people who want to lose weight; an average person undergoing this method will lose half their excess weight in the first 2 years - many will lose far more in less time. Any type of surgery has possible complications, however, Gastric Band Hypnosis will help you to feel that you really have had this surgery performed on you, enabling you to eat far smaller portions without feeling hungry and without the side effects of invasive surgery. 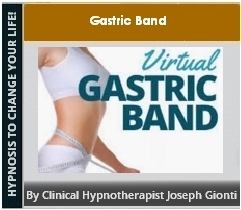 Gastric Band Hypnosis for Weight Loss is becoming increasingly popular and many people have already experienced the benefit of losing weight easily and effortlessly with this hypnosis program download. If you are ready to lose the same amount of weight, without an expensive and time consuming surgery that has risks and side-effects - download your program today!